The illustrious Salon d’Automne - from its inception the world’s leading avant-garde venue along with the Salon des Artistes Indépendants - opened its annual exhibition at the Grand Palais on October 1, 1912. Displaying over seventeen hundred paintings and sculptures to an expectant Parisian public, it included a portrait section of nineteenth century paintings all executed by French artists** and, most notoriously, a gallery of increasingly scandalous and rejected Cubist works such as La Maison Cubiste, a three dimensional installation that housed works by Duchamp**, Léger, Gleizes and others. 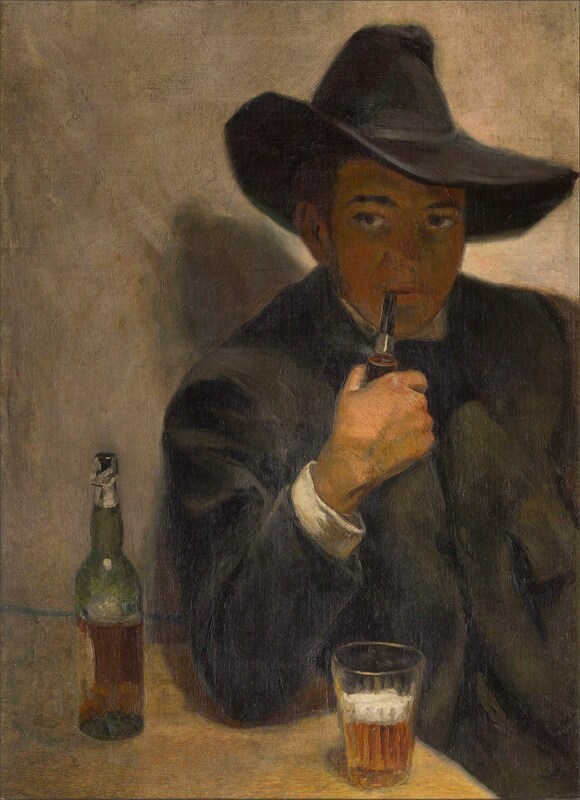 It was for this Salon that Diego Rivera** prepared two large format paintings: Retrato de un español / Portrait of a Spaniard and The Crock, both dated 1912. By this time, Rivera was extremely anxious about the development of his craft. Residing in Paris, he counted Modigliani**, Picasso, and many other artists - all champions of an incessant revolution - among his closest friends. Through them, Rivera understood the need to produce “a fully modern concept of modernity, free from regional themes, far from naturalism and extremely intellectual”. While thoroughly committed to the modernist cause, Rivera was simultaneously seeking a stylistic breakthrough through the canons of art history. His legendary vitality and passion were concentrated on studying the work of one artist in particular: Doménikos Theotokópoulos, most widely known as El Greco (1541-1614)**. Such adherence and reverence to the old master tradition found itself in a direct collision course with recent developments in the Parisian art world: Rivera’s two works at the Salon d’Automne were hanging in close proximity to Francis Picabia's (1879-1953) radical La Source (1912), Kupka’s Amorpha, Fugue a Deux Couleurs (1912), Amedeo Modiglani’s (1884-1920)** Tête sculptures and Jean Metzinger’s (1883-1956) Danseuse au Café, among others. Interestingly, Marcel Duchamp's (1887-1968) Nu Descendant un Escalier No. 2 (1912), now considered an icon of modernism, was rejected to participate in the same Salon. In addition to El Greco**, Rivera was intensely focused in studying Henri Matisse (1869-1954)** and Georges Seurat (1859-1891)**. The shock of Cézanne** came abruptly. “in February 1910, [Rivera] saw an exhibition of Cézanne’s** and the impression was such that it gave him, after he spent a day in the studio, a nervous fever …/.. the doctor diagnosed Diego’s very high temperature as produced entirely by a severe nervous shock. The work of Cézanne** had opened up for Diego the endless possibilities of modern art. He became almost fanatical in his admiration for his painting”. Painted in 1912, Retrato de un español / Portrait of a Spaniard emerged within a deeply ideological and fiercely creative cultural milieu-the most consequential in the history of modern art. We now know this is a portrait of Hermenegildo Alsina, a fine books binder and Spanish decorative artist who was a close friend of Rivera in Madrid, Barcelona and later in Paris. 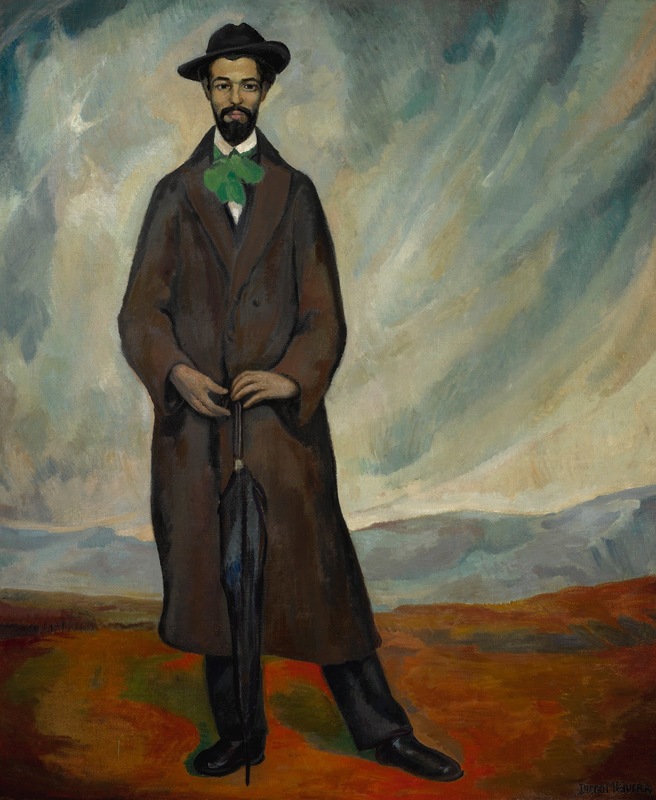 Originally known as Portrait of Hermenegildo Alsina, the painting was exhibited under this title at the Paris Salon and at the Kunstausstellungsgebaude, Secession in Munich in 1913. After its re-appearance at Sotheby’s in 1968, it was wrongly titled Portrait of Utrillo and also as Portrait of Eduardo Chicharro, the artist’s mentor at the San Fernando Academy in Madrid. Diego himself referred to it as The Man with the Umbrella in his memoirs My Art, My Life. Occupying the complete height of the painting, Hermenegildo Alsina, the “Spaniard”, is depicted as an elongated figure in a barren landscape. Strong echoes of El Greco’s St John the Baptist (circa 1600) at the Museo de Bellas Artes, Valencia and San Bernardino de Siena (1603) at the Prado Museum, Madrid are visible in the figure’s languid, fragile pose. Masterly rendered are the famously tormented skies reminiscent of the ones portrayed in St. John the Baptist. Professor Martín-Lozano noted an additional visual reference and possible source of inspiration: El Anacoreta (the Anchorite), a landmark painting by Ignacio Zuloaga (1870-1945) of 1907 now at the Musée du Quai d’Orsay in Paris. Depicting the emaciated body of a hermit, the impossibly elongated figure dominates the foreground rising upward from the earth like a grown tree, his fingers and hands crisscrossed as he vacuously stares at the sky. Unlike in the old master paintings, Rivera’s Spaniard stares confidently at the viewer. The young man projects a carefully constructed air of nonchalance. Embodying the image of a dandy, he is casually attired in a fashionable hat and an elegant brown overcoat. A green feathered necktie complements his cultivated look as he retains the viewer’s attention with absolute finesse. As in El Greco’s** painting, Rivera's composition reveals a vividly agitated sky filled with onerous grey clouds. White strokes of paint seem to radiate from the Spaniard as to symbolize a halo of earthly sanctity. When comparing the finished work to Boceto para el retrato de un español (ca. 1912), offered in these rooms in November 2016, a number of differences arise: while Alsina hides his hands inside the pockets of his long coat, the finished version depicts him delicately holding an umbrella: a vital accessory of the fashion forward ‘man about town’. Most striking is the recent discovery by [Spanish curator] Julio Niebla of a photograph portraying a young Hermenegildo Alsina. 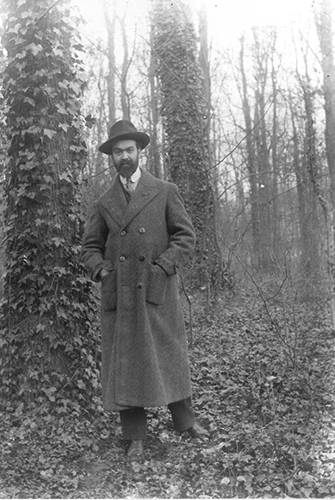 The discovery of this photograph belonging to the collection of Alsina’s descendants reveals two distinct possibilities: either Rivera had the model pose for him in situ somewhere in the woods near Barcelona and finish the composition in his studio at a later point, or the artist casually saw the photograph and decided to work directly from this image. In both the photo (anonymous, undated) and the study, Alsina presents the same languid frontal pose. The study, however, reveals an immediacy lacking in the finished canvas. Alsina’s walk seems to have been suddenly interrupted as if surprised by the sudden gaze of the photographer. In contrast to the photo, his left foot appears slightly turned towards the back while in the sketch it is placed on an equal plane. Although a man of considerable height, Alsina was purposely “elongated” by Rivera in the Mannerist style** of El Greco and Zuloaga. An additional difference between this photographic document and the painting is the background. As an idealized rendition of a genre painting, the Spaniard is portrayed against a barren landscape with colors reminiscent of the Castilian dry plateau. Devoid of trees and vines, a sense of vastness, of absolute infinity triumphs over the landscape thus further alienating the Spaniard from terrestrial concerns. L'illustre Salon d'Automne, dal suo inizio sede principale d'avanguardia al mondo insieme al Salon des Artistes Indépendants, aprì la sua mostra annuale al Grand Palais il 1° ottobre 1912. Mostrando oltre millecinquecento dipinti e sculture a un parigino in attesa pubblico, includeva una sezione di ritratti di dipinti del XIX secolo tutti eseguiti da artisti francesi e, più notoriamente, una galleria di opere cubiste sempre più scandalose e rifiutate come La Maison Cubiste, un'installazione tridimensionale che ospitava opere di Duchamp, Léger, Gleizes ed altri. Fu per questo Salon che Diego Rivera** preparò due dipinti di grande formato: Retrato de un español (Ritratto di uno spagnolo) e The Crock, entrambi datati 1912. A quel tempo, Rivera era estremamente ansioso per lo sviluppo del suo mestiere. Residente a Parigi, come Modigliani**, Picasso e molti altri artisti, tutti campioni di una rivoluzione incessante, tra i suoi amici più stretti. Attraverso di loro, Rivera ha capito la necessità di produrre "un concetto completamente moderno di modernità, libero da temi regionali, lontano dal naturalismo e estremamente intellettuale". Pur essendo profondamente impegnata nella causa modernista, Rivera cercava contemporaneamente una svolta stilistica attraverso i canoni della storia dell'arte. La sua leggendaria vitalità e passione erano concentrate nello studio del lavoro di un artista in particolare: Doménikos Theotokópoulos, il più conosciuto come El Greco (1541-1614)**. Tale aderenza e riverenza alla vecchia tradizione del maestro si è trovata in rotta di collisione diretta con i recenti sviluppi nel mondo dell'arte parigino: le due opere di Rivera al Salon d'Automne erano appese in prossimità del radicale La Source di Francis Picabia, di Kupka Amorpha, Fugue a Deux Couleurs, di Amedeo Modigliani** Tête sculture e Jean Metzinger di Danseuse au Café, tra gli altri. È interessante notare che il discendente di Marcel Duchamp (1887-1968)** Nu Descendant un Escalier n. 2 (1912), ora considerato un'icona del modernismo, fu respinto per partecipare allo stesso Salon. Oltre ad El Greco**, Rivera si dedicò intensamente allo studio di Henri Matisse (1869-1954) e Georges Seurat (1859-1891)**. Lo shock di Cézanne arrivò all'improvviso. "nel febbraio 1910 [Rivera] ha visto una mostra di Cézanne e l'impressione è stata tale da dare lui, dopo aver trascorso una giornata in studio, una febbre nervosa ... / ... il dottore diagnosticò la temperatura molto elevata di Diego prodotta interamente da un grave shock nervoso. Il lavoro di Cézanne aveva aperto a Diego le infinite possibilità dell'arte moderna. Divenne quasi fanatico nella sua ammirazione per la sua pittura". Dipinto nel 1912, Retrato de un español (Ritratto di uno spagnolo) è emerso in un ambiente culturale profondamente ideologico e fieramente creativo, il più consequenziale nella storia dell'arte moderna. Ora sappiamo che questo è un ritratto di Hermenegildo Alsina, un raffinato raccoglitore di libri e artista decorativo spagnolo che era amico intimo di Rivera a Madrid, Barcellona e più tardi a Parigi. Originariamente noto come Ritratto di Hermenegildo Alsina, il dipinto è stato esposto con questo titolo al Salone di Parigi e alla Kunstausstellungsgebaude, Secessione a Monaco nel 1913. Dopo la sua riapparizione a Sotheby's nel 1968, è stato erroneamente intitolato Portrait of Utrillo ed anche come Ritratto di Eduardo Chicharro, il mentore dell'artista all'Accademia di San Fernando a Madrid. Lo stesso Diego si è riferito a The Man with the Umbrella nelle sue memorie My Art, My Life. Occupando l'altezza completa del dipinto, Hermenegildo Alsina, lo "spagnolo", è raffigurato come una figura allungata in un paesaggio arido. I forti echi del San Giovanni Battista di El Greco (circa 1600) al Museo de Bellas Artes, Valencia e San Bernardino de Siena (1603) al Museo del Prado, Madrid sono visibili nella posa languida e fragile della figura. I cieli notoriamente tormentati ricordano magistralmente quelli raffigurati in San Giovanni Battista. Il professor Martín-Lozano ha notato un ulteriore riferimento visivo e una possibile fonte di ispirazione: El Anacoreta (l'Anacoreta), un dipinto storico di Ignacio Zuloaga (1870-1945) del 1907, ora al Musée d'Orsay a Parigi. Raffigurante il corpo emaciato di un eremita, la figura impossibilmente allungata domina il primo piano che sale verso l'alto dalla terra come un albero cresciuto, con le dita e le mani incrociate mentre guarda vacuamente il cielo. A differenza dei vecchi maestri dipinti, lo spagnolo Rivera fissa fiducioso lo spettatore. Il giovane proietta un'aria di nonchalance costruita con cura. Incarnando l'immagine di un dandy, è vestito con indifferenza in un cappello alla moda e un elegante soprabito marrone. Una cravatta verde piumata completa il suo look colto mentre conserva l'attenzione dello spettatore con assoluta finezza. Come nel dipinto di El Greco**, la composizione di Rivera rivela un cielo vividamente agitato pieno di pesanti nuvole grigie. Pennellate di vernice bianche sembrano irradiare dallo spagnolo per simboleggiare un alone di santità terrena. Confrontando il lavoro finito con Boceto para el retrato de un español (1912 circa), offerto in queste sale nel novembre 2016, sorgono alcune differenze: mentre Alsina nasconde le mani nelle tasche del suo lungo cappotto , la versione finale lo raffigura tenendo delicatamente un ombrello: un accessorio vitale della moda in avanti "uomo della città". La cosa più sorprendente è la recente scoperta del curatore spagnolo Julio Niebla di una fotografia che ritrae un giovane Hermenegildo Alsina. La scoperta di questa fotografia appartenente alla collezione dei discendenti di Alsina rivela due possibilità distinte: o Rivera aveva il modello posato per lui in situda qualche parte nei boschi vicino a Barcellona e finire la composizione nel suo studio in un secondo momento, o l'artista ha casualmente visto la fotografia e ha deciso di lavorare direttamente da questa immagine. Sia nella foto (anonima, non datata) che nello studio, Alsina presenta la stessa languida posa frontale. Lo studio, tuttavia, rivela un'immediatezza carente nella tela finita. La passeggiata di Alsina sembra essere stata improvvisamente interrotta come se fosse sorpresa dallo sguardo improvviso del fotografo. In contrasto con la foto, il suo piede sinistro appare leggermente rivolto verso la parte posteriore mentre nello schizzo è posto su un piano uguale.